At one point I was awake and working for 48 hours to meet the photo deadline. And in between my professional obligations I had to fit in being present for my family, dealing with the loss of my house, and defending myself in court (along with the custody issue, my ex is petitioning the court to punish me for losing the house, including asking for me to be incarcerated). Fun times. Blackberry flavored whiskey and ginger ale tastes like freedom after months of work. Now, after meeting my last deadline, I have found myself suffering from temporal whiplash. As soon as I uploaded the photos we climbed into the Jeep and headed to a camper owned by friends for a weekend of campfires and whiskey. I spent a lot of time Saturday and Sunday just sleeping. Come Monday morning, after I had gotten Charlotte off to school, I found myself at sort of a loss of what to do. I cleaned the kitchen and family room. I did the dishes and made dinner. I spent a lot of time thinking about all the stuff I had to do and realizing that I had plenty of time to do it in. The rest of the week has been the same. I have stuff to do. But there is no urgency. It’s a strange position to be in. In fact it weirds me out not to have a deadline constantly pushing at me. I don’t have to rush my kids through bedtime so that I can get back to work. I’m not staying up until three in the morning sewing. Right now my To Do list is full of items like “make dinner” and “pack up one shelf of books”. A friend posted a link to the article “This is the Reason So Many Unbound Women Fear They’re Lazy” on Facebook the other day. Reading through it, I found myself nodding in agreement. I’ve spent so much of my life trying to fill my every waking hour to justify my existence, especially once I stopped working outside of the house. Shifting to a focus more on what I and my family need done to serve our lives is a big, scary step. Many times throughout these first few days I have found myself sitting down with nothing that needs my immediate attention. My busy brain would kick into gear those times, trying to kickstart anxiety over the fact that I was just sitting there. I am working to reconcile my busyness with this lack of deadlines. I am trying to actively enjoy, rather than making a show of tolerating, this less frantic pace. I still have a move thousands of miles away to arrange. I still have legal wrangling to deal with. I still have a book and family that needs my attention. That is more than enough right now. I headed back to Salt Lake City this last weekend for the Salt Lake Comic Con. It was me, Stephan, our kids, two checked duffel bags of inventory, and a determination to sell handmade geekery to the masses. Let’s start with the good. Despite a mishap that saw myself, the kids and luggage on the train to the hotel and Stephan left behind at the station, the trip there was relatively uneventful*. Ben managed to keep his chaotic energy to a minimum while Charlotte played numerous games of Solitaire on her phone. We got to our spot in the Salt Palace Convention Center with little difficulty and got set up in record time. Stephan provided extra lung power to get Johanns Rex inflated and ready for his convention debut. I forgot to pack clothes pins so I had to improvise a hanging solution for the skirts with binder clips. All in all, I think the set up was good. 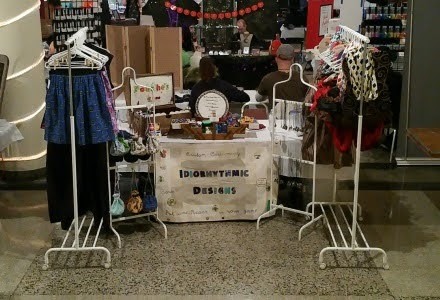 Especially later when I raided the empty space next to me for another table for the dice bags. You know what they say about a man with big lung capacity, don’t you? When not modeling bustles in the booth, Johanns T-Rex pilots an airship crewed by raptors called The Clever Girl. The good came in many different forms: Several friends stopped by the booth to offer support via food runs, helping to hock wares, and entertaining children. Charlotte spent a lot of time in the booth drawing and running the Square. Everyone who heard the refrain, “All the skirts have pockets” squealed with joy. At least three men picked up a business card because their wives weren’t at the convention but they were certain to be interested in the skirts. At one point, a woman pulled a skirt on over her leggings, paid and then twirled out of the booth. Skirts and bustles ready to cover some geeky butts. The bad, though, was pretty bad. At the end of the con I joked with myself that the awesome thing about capitalism is that it could enumerate just how much of a failure a person is in dollars and cents. I had come out to the convention with the optimistic goal of $10,000 in sales. That number would be really hard to make, but I had twelve grand in inventory, plus I expected to get lots of commissions for the skirts. Based on what I made at SLC FanX in March (almost $1,500 with half the number of attendees) I could reasonably expect to make $3,000. Readers, I pulled in a whopping $915. Saturday night, as I broke down the booth, I had a hard time keeping Jerk Brain at bay. Every single horrible thing he has ever said to me felt true. I was a worthless loser, a dumbass who chose the wrong thing every time. I was stupid and irresponsible and lazy and a burden to my family. Why did I keep deluding myself into thinking I could support myself and my family by sewing? If anyone could do it we wouldn’t be buying cheap T-shirts from sweatshops. Sunday wasn’t much better. I became intimately acquainted with the hotel bed while Stephan and the kids spent time with friends. I deactivated my Facebook account because I couldn’t face people with the weight of my failure. Monday we flew back to Chicago with me dragging behind my family every step of the way. I kept thinking about how I had proven myself a failure, how I would have to give up the sewing and the idea that I could make a living from home. I was convinced that the only thing I was good for was taking up space. Back home, once I was sure that Trixie still loved me, we had unpacked and gotten the kids off to bed, Stephan poured me a glass of wine and we talked. And he pointed out that really, all I proved was that I shouldn’t do conventions right now. The benefit of a host of potential customers in a small space wasn’t actually manifesting. I handed out a lot of business cards and got people signed up to my mailing list, but that was something I could do from home. Stephan talked me off of the ledge of giving up on everything. We came up with a new game plan that focuses on non-event related sales and marketing. And this morning I started listing those skirts that didn’t sell on my Etsy. You would think making a tenth of what I was expecting would fall under the category “Ugly” and, yet, this isn’t the case. One of the things that I like about Salt Lake City is that people are very nice. When the train fiasco happened people were kind to help me get luggage off the train at the next station to wait for Stephan. A man stopped by and checked up on us when he saw me and the kids sitting out on our own late at night. That friendliness was in attendance for the most part at the convention. The flip side, however, was a level of bad behavior I’ve never experienced at another convention. The woman reached out and touched Kyra’s face! Poor Kyra bore the brunt of the bad behavior that weekend. At one point a guy walking past yelled at her, “I’m in the need of some discipline, will you discipline me?” Again, something that won’t be an issue if I don’t vend at conventions, however I am now imagining how I can weaponize my belly fat so I can just start whapping such dude bros.
Because this kind of thing always happens in threes, I overheard a man yelling that he only wanted the two hottest girls from a group cosplay in his photo. Chalk one more person up for a hit a run by my thunder thighs. So now it is back home time. Ben is now in full day kindergarten, which means I now have dedicated hours to sew. And that’s what I’m going to do. I have a few commissions from SLCC to work on. That should also mean there will be more posting here. First up, I’ll get a tutorial for the skirts posted in the next few days. *We flew from Chicago to SLC. The train I mention was from the SLC airport to the hotel. At $10 for a one way trip for four people, it was well worth the late night Griswold-esque adventure. Last week we headed up to Milwaukee for the Midwinter Gaming Convention. We had a booth there, and had plans to get some gaming in. This is Midwinter’s fifteenth year, and our third, and it has grown larger and better every year we’ve been. This was the first year both Stephan and I had wares to peddle, and the first year I had so many booth helpers. It all added up to a lot of fun. What made the biggest difference, I think, is that I had two booth helpers throughout the convention. Our friends Denis and Chrissy came along, and with them on hand, we had four adults to cover the booth the entire weekend. That meant Stephan wasn’t stuck on Ben patrol the entire time. It meant we both got to go to lunch together one day. It meant I got to spend time with my son outside of the vendor’s hall for the first time ever. I can’t thank the two of them enough for their help the entire weekend. I had forgotten how much I enjoyed gaming cons. Midwinter’s focus is on LARP, but it has programming dedicated to board and video games, as well as a strong reenactment presence thanks to the SCA. So while there is a costuming contingent, it isn’t a costume heavy convention. And the convention has a very relaxed and friendly atmosphere. I found myself joking and laughing, things I hadn’t done in a long time. I managed to deal with the little anxiety that cropped up throughout the weekend, which means that medication and therapy is working for my mental health issues. The Milwaukee Hilton is a beautiful hotel, with lots of ornate staircases and decor, as well as hallways and seating areas for hangouts. I spent most of my time in the vendor hall, which was placed in a baroque fantasy of a ballroom with chandeliers and gold molding on the ceiling. The hotel staff was super friendly and helpful, a big plus when you are attending a convention where there can be tension between fans and non-fans. That same weekend there was a girl’s volleyball conference in the hotel. This led to lots of interactions with non-gaming people. I witnessed an abundance of stares and whispered comments, but I was never the target of them. In fact I had several women approach me to ask about what was going on. I think the pink hair establishes me as part of the “weird people” but that my size and gender makes me non-threatening enough to be approachable. This isn’t the first time I’ve played ambassador for the geek community. Back in 2002 at ConJose in San Jose, I fielded questions from people on the street who saw me wearing a badge, but not a costume (no pink hair back in those days). And the fan side of things gave as good as they got on the passive aggressive front. I overheard one LARPer bragging about having invented “Trolling: the LARP” where he and his friends paraded past groups of volleyball players and parents in their costumes and played their characters to an exaggerated degree. I only ran into one instance of bad customer behavior: a woman incredulously demanding to know if “that ruffle thing” truly was $75. When I confirmed that, yes, I do charge $75 for my bustles, she huffed off. I know that prior to her asking she had snapped a shot of the bustle (the flash is a dead giveaway) and suspect she’ll show the picture to a sewing friend and ask if said friend will make one for her. I wish her good luck with that. I did overhear another customer ask the vendor next to me if they would get a discount on a $20 item if they carried it around the convention and told people where they would get it from. There seems to be this belief among a certain set of attendees that vendors are starving for marketing and will give away their wares for word of mouth advertising. I have never once met a vendor who has done such. I wouldn’t be surprised if there is one or two who have, I just have never encountered them. The only other annoyance was the number of times people congregated in front of my booth and blocked access to it. That is easily dealt with. I whip out my phone and ask the people if they could move because I want to get a shot of my set up. Nine times out of ten the people realize they were blocking the way and move on apologetically. The tenth time, the people move, but with resentment at having been asked to move. Either way, it’s not skin off my nose, I got them to clear the way. The final attendance count was just shy of 1100 members. Not a bad showing. I made just over 50 cents per attendee (which is about what I plan on making at any convention). It was less than I had hoped, but I didn’t have any big items with me this time around. There’s time before the next convention to get plenty of coats made up for off the rack purchases. According to those we talked to, Midwinter has seen an average of 10 percent growth in attendance each year. It’s clear that they do a lot of work not only in planning great programming, but also in advertising their presence. They do a lot of social media work, have a strong Facebook page, and got the convention covered by local TV press. It is a lot of work, but it is paying off for them. I mention this because over the course of the weekend I was approached by two different conventions about vending. Both are brand new, both are asking for $200 for booth space. One mentioned on its website that they expect anywhere between 350 to 2,400 attendees at their first con. Think about that for a moment. Presuming that they reach their minimum number, and that I make 50 cents per attendee, I will lose money attending that convention. The other is one could see slightly better numbers, but it is still the first year, still untested, and still not worth paying that much for a space. When conventions charge that much for a space, with such low numbers, it is clear they are looking to cover their costs on the backs of their vendors rather than through ticket sales. We’ll be back to Midwinter next year for sure.